There is a gorgeous ARTdornment piece on sale this week, which features a male and female Eclectus in an ornately sculpted frame, done in antique gold, with matching earrings, as well as a bracelet. Beautiful green jasper stones highlight the jewelry. In addition, there are five new pairs of charm earrings (shown below). While they are not bird related or sculpted from clay, I just think they are adorable! The new charm earrings feature: roses, ballerinas, violins, elephants, and books.They would make a nice last minute gift! All of the pieces shown here are being auctioned on eBay for five days, ending on Wednesday. 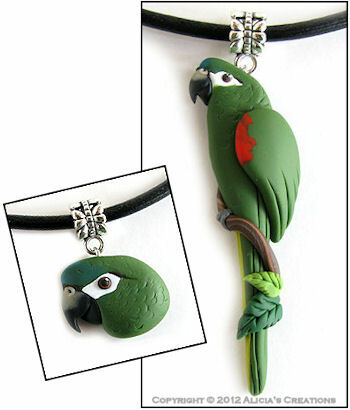 BIRD OF THE MONTH: Hahn's Macaw + Holiday Sale! From my flock to yours, we want to wish you all a warm and happy Holiday Season and a joy-filled New Year! The Bird of the Month for December is the Hahn's Macaw! Due to the rush orders that I'm working on, I didn't have time to make a full collection this month, so there are just two Bird of the Month pendants this month. All of this month's pieces are being auctioned on eBay for five days, ending on Wednesday, December 12th. The discount code can be used in all three of my Etsy shops through New Year's Eve! NEW ON EBAY: Flights of Fancy & More! There is a striking new Serendipity (Scrap Clay) Cockatiel pin on eBay this week, perfect for adding some color to winter wear! 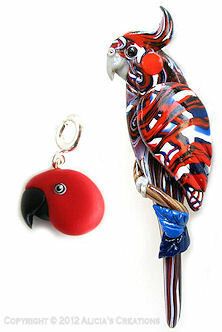 There is also a new female Eclectus charm, as well as a new assortment "Bird Poop" jewelry this week on eBay (not shown here), including another magnet, charm, and two pendants. 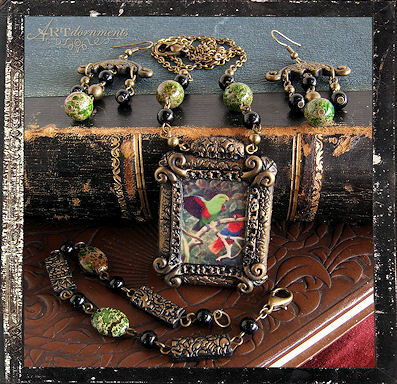 In addition, I have five new whimsical "Flights of Fancy" styled necklaces for you this week! They include: Cockatoo, White Bellied Caique, Ringneck/Quaker/Conure (up to YOUR imagination! ), Male Eclectus, and Female Eclectus. All of the pieces are on eBay for five days, until Wednesday, December 12th. Good luck with your bids!